chats via live webcast with a staff member at the Reef HQ Aquarium in Townsville, Australia. LONDONDERRY -- Thanks to the marvels of modern technology, students at Londonderry High School experienced the field trip of their lives recently: exploring the depths of Australia’s Great Barrier Reef without ever getting their feet wet — or even leaving Londonder­ry, for that matter. In a very unique video conference, dozens of students, including members of teacher Bill Knee’s Advanced Placement Environmental Science course, embarked on a journey that would, indeed, make Jacques Cousteau proud. 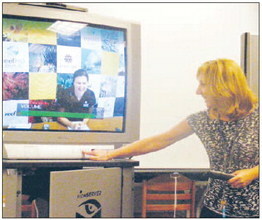 During the collaboration with staff members at the Reef HQ Aquarium in Townsville, Australia, Granite State students could chat live and freely with Australian marine biologists. As the local students unbuttoned heavy overcoats and woolen scarves warding off the evening chill, it was breakfast time for the colorful Aussie fish residing in the aquarium’s 600,000-gallon reef tank, and the “natives” were quite lively. This was the school’s second time hosting such a web conference, according to library media specialist Lynne Jackson, who noted a similar “virtual” experience was offered to students and community members two years ago and was met with much success. The Londonderry Parent-Teacher Organization sponsored both programs. Dressed in full scuba gear, one marine biologist who introduced himself as Craig spoke to the students from one of the large television screens set up inside the high school’s library media center. Though half a world and a 14hour time difference away — not to mention 15 feet below the tank’s surface — Craig’s voice resounded clearly to the captivated students. Colorful parrot fish fluttered by him on the screen. Over the 1 1 ⁄ 2- hour program, the divers from Down Under quizzed the students, testing their knowledge of the region’s species. “Does anyone know what this one is called?” Craig asked, motioning to a basketball-sized coral cluster. Several students chimed in, offering the correct answer (brain coral). Other students carried clipboards, furiously jotting down notes on the animals’ habitats and behavior as they filled out worksheets for Knee’s class. “Oops, I think I saw a bit of cleaning going on,” Craig said, motioning the camera toward a tiny cleaning wrasse fish, working away at the grooming of a rabbit fish. Inside the tank live some 150 different species of tropical fish and 120 or so varieties of coral, not to mention several species of sharks, sea turtles and countless other colorful creatures. The Reef HQ Aquarium opened in 1987, according to its Web site, and attracts over 100,000 visitors annually. Aquarium staff said a main mission is to both allow “landlubbers” the chance to experience the marvels of the nearby Great Barrier Reef, while also protecting the real deal from overzealous tourists. The reef itself boasts over 1,500 species of fish, with many remaining to be discovered, aquarium officials said. The Great Barrier Reef is over 1,400 miles long and covers an area approximately half the size of Texas. Teacher Beth Halloran, who teaches freshman science and college prep biology, later shared her own experiences studying abroad in Queensland, Australia, during her junior year in college. Halloran, who holds a master’s degree in marine biology, shared photos of her six-month stay in Australia, where she studied tropical fish, invertebrates and corals. “It was an awesome experience,” Halloran told the students, encouraging them to consider the possibilities of studying abroad during their upcoming college years.